BRIGHT, SOFT LIGHT: The OxyLED Under Cabinet Lighting uses 78 powerful LEDs to provide much-needed illumination to dark areas. This light won't flicker, flare, or hurt your eyes. EXTREME ENERGY EFFICIENCY: Our eco-friendly design is safe for you and safe for the planet. The LED Under Cabinet Light is 80% more energy-efficient than standard fluorescent lights. You'll use less power and slash your energy bills! SLEEK MODERN DESIGN: It's so much more than just a light-it's a statement piece. The low-profile design is sure to add a sophisticated touch to your cabinets, office, bedroom living room, art studio, or anywhere else you'd like to create a warm, cozy ambience. 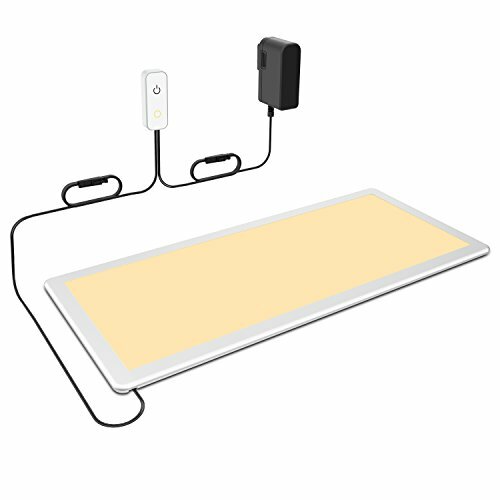 SIMPLE TO INSTALL AND USE: Get the Under Counter Lighting up and running in a flash! All you need is a flat surface and a screwdriver. Just lay it flat, insert the screws, and secure it tightly. HIGH CRI, EYE FRIENDLY: CRI is Ra 90 (CRI of sun is 100). The light is soft, warm, and natural. You'll enjoy powerful illumination without sacrificing comfort.